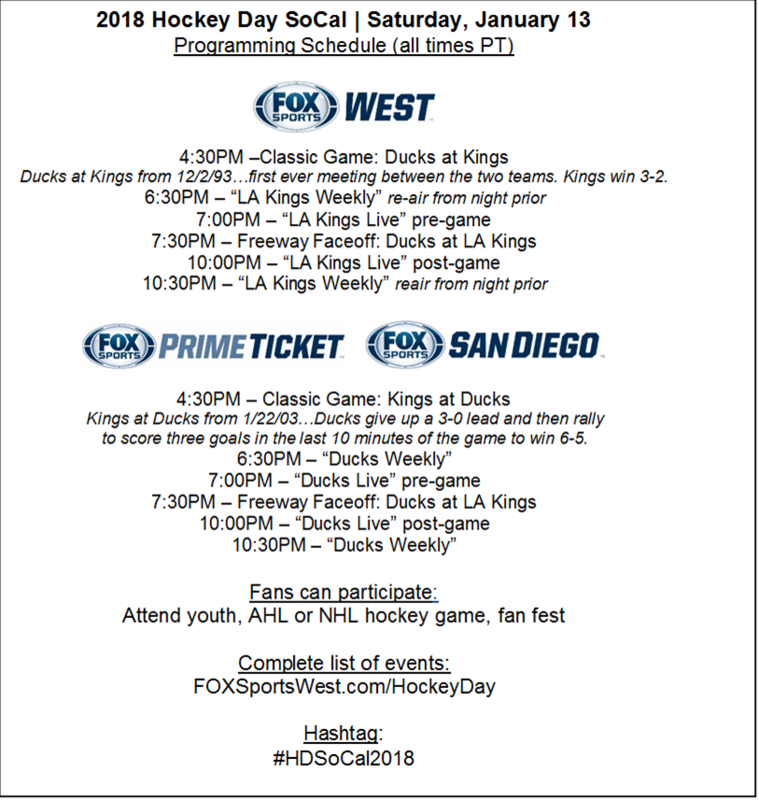 FOX Sports West, Prime Ticket and FOX Sports San Diego, in conjunction with the National Hockey League’s Anaheim Ducks and Los Angeles Kings, will host the first annual “Hockey Day SoCal” set to take place on Saturday. Fans are invited to attend a variety of hockey-centric events across Los Angeles, San Bernardino, Orange and San Diego counties that day, including Jr. Kings and Jr. Ducks hockey events, Ducks Fan Fest at Anaheim Ice, L.A. Kings Fan Fest at L.A. Live, the Bob Miller statue unveiling ceremony on Star Plaza and a banner unveiling inside STAPLES Center, and any one of the three professional hockey games being played across the Southland. For a complete listing of all events, visit www.foxsportswest.com/hockeyday. Complementing the day, FOX Sports West, Prime Ticket and FOX Sports San Diego will each offer 6.5 continuous hours of hockey themed programming beginning with two Kings vs. Ducks classic games at 4:30pm and concluding with live Ducks vs. Kings Freeway Faceoff coverage. Footage and interviews will be compiled from the various events across SoCal that day and can later be seen throughout the Ducks vs Kings telecasts that evening.